Trinity Lutheran Church of Broken Arrow - Bible and Beliefs - What Are Lutherans? In one sense the story of Lutherans began with Martin Luther (1483-1546). He was born in Eisleben, Germany, and had God-fearing parents. Martin was a good student at school, and his father wanted him to become a lawyer. However, Luther was troubled. In his heart he knew he was a sinner in the eyes of God. Try as he could to keep God’s commandments, he knew he had failed. You might say the burden of the Law of God weighed heavy upon him. Luther hoped he could find the God of peace. Forsaking the advice of his father, Luther entered the monastery and became a monk. Hoping that the life of a monk would bring peace with God, Luther did everything he was told. He obeyed all the rules. He even tried to punish himself by beating his own body. Little did he realize that our Lord Jesus already took the punishment for his sins on the cross. In 1508 Luther was sent to Wittenberg to be a teacher at the new university in that town. This was the turning point of his life, for he soon began to study and teach the Bible at the university, and preach in St. Mary’s Church. As Luther studied the Bible, he came see that a person cannot gain peace with God through the Commandments, which we have not kept. Yet, God has won our peace through Jesus Christ. Jesus came to earth and, as the God-man, suffered and died on the cross to pay for our sins. Then He rose to life. Because of this work of Jesus, God has declared sinners forgiven! Luther’s discovery of the Gospel of forgiveness in Jesus might have remained hidden in Wittenberg had it not been for one man: John Tetzel. This Dominican monk came into the land near Wittenberg and began to sell indulgences. The church had taught that Jesus paid for the eternal punishment of our sins, but people still had to face the temporal punishment of their sins, here in time or hereafter in purgatory. One way to avoid this temporal punishment was to purchase an indulgence. John Tetzel was not allowed to enter Wittenberg to sell his indulgences, but people from Luther’s church went twenty miles down the road and purchased them anyway. Through the study of Scripture, Luther had become convinced that indulgences were not needed to deliver a person from his sins. No, Jesus Christ had already, by His suffering and death for us, taken away our sins and had earned us full forgiveness of both temporal and eternal punishments. We cannot purchase (the forgiveness of sins) what has already been given us as a free gift by God! Luther could not contain himself any longer. He got out his pen and began to write. On October 31st, 1517, Luther nailed his Ninety-Five Theses to the door of the Castle Church. In them he objected to the sale of indulgences. In a short time, the theses were copied and spread all over Germany and into other parts of Europe. These theses were not well received by Roman Catholic leaders and the pope. After a couple years of attempting to silence Luther, the pope had him excommunicated. By 1521 Emperor Charles V, the highest secular ruler of the land, also condemned Luther, declaring him an outlaw. But Frederick the Wise, the ruler of Saxony, protected Luther. And so, by God’s providence, Luther was able to continue studying, teaching and writing the truth of Scripture about our Savior, Jesus Christ. The preaching of Martin Luther is considered by many to be the beginning of the Protestant Reformation. In reality, Lutheran teaching did not begin with Luther. Luther simply brought people back to the Bible. Luther believed that the Bible is the Word of God and it is the only source of teaching in the church. We are never to believe something simply because it was taught by Martin Luther; we are to believe it because it is taught by the Word of God. In 1530, Emperor Charles V invited Luther’s friends to Augsburg, Germany. He asked the Lutheran leaders to prepare a document, describing their beliefs. Luther himself could not attend the meeting; the emperor had not given him safe conduct, and he could have been killed. Luther’s friend and co-worker, Philip Melanchthon, wrote the confession of faith which is known as the Augsburg Confession. It was accepted by the Lutheran princes and theologians, but rejected by Charles. The Augsburg Confession remains to this day as a faithful expression of Scriptural and Lutheran teaching. For more history on Martin Luther, pick up a free copy of the 48-page booklet, Living with Luther, in our church office. Or order Luther, Biography of a Reformer, from Concordia Publishing House, 1-800-325-3040. Lutheranism spread through Europe and eventually all over the globe. As immigrants came to America, so also did Lutherans. At first they were divided by geography, language (Swedish Lutherans, Danish Lutherans, Finnish Lutherans, etc.) and theology. Today there are only theological differences among Lutherans. 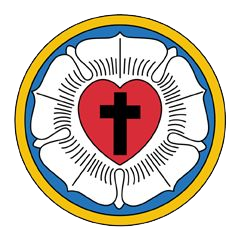 The Lutheran Church – Missouri Synod * is one branch of the Lutheran Church. [Note: A “synod” is a church body that “walks together” in the same teachings.] Here is a brief explanation of how this synod began, followed by a summary of our teaching. By the 1800s, the churches of Germany had become infested with rationalism, the belief that we can only accept in the Bible the things that make sense to our human reason. The miracles of the Bible and the inspiration of the Bible were challenged by many. Faithful pastors and parishioners of the Lutheran Church were pressured to conform. Some resisted. In 1838 a group of ships sailed from Germany to Missouri to worship the Lord with complete freedom. These were the beginnings of the Lutheran Church – Missouri Synod. From the very beginning this group held to the inspiration and inerrancy of the Bible. They believed the words, “Thy word is truth” (John 17:17). “All Scripture is inspired by God and profitable for teaching, for reproof, for correction, for training in righteousness; that the man of God may be adequate, equipped for every good work” (II Timothy 3:16-17). Not simply the writers of the Bible were inspired, but the “Scripture” itself, the very words of the Bible. If it is true that the very words of the Bible have been directed there by God, then it follows that the Bible has no errors or contradictions. This is the teaching of inerrancy: the Bible is “without error.” It is in every word God’s truth! Sad to say, a number of Christian pastors, people and church bodies have given up the teaching of inerrancy. Unfortunately, forsaking inerrancy means forsaking also the teaching of Scripture Alone. For if the Bible is a mixture of divine truth and human error, the individual must place himself above the Bible to decide what is to be believed and what is not to be believed. Consequently, those church bodies that reject the inerrancy of Scripture find among their churches and pastors a great deal of disagreement about what the Bible teaches. One will believe in the six day Creation, another will believe that God made the world through the process of evolution, and that Adam and Eve were not historical characters. One will believe in a worldwide Flood and the other will not. One will believe in a literal Virgin Birth of Jesus, the other will not. One will confess the bodily resurrection of Jesus, another will not. The Lutheran Church bodies that believe in the inerrancy of the Bible are the Lutheran Church – Missouri Synod (LC-MS) and the smaller Wisconsin Evangelical Lutheran Synod (WELS). To understand historic Lutheranism, one must become acquainted with five major teachings of Scripture that Lutherans in the Missouri Synod confess. In II Corinthians 5:19 Paul said, "God was in Christ reconciling the world to Himself, not counting their trespasses (sins) against them.” Because the God-man, Jesus Christ, took the sins of the world upon Himself and endured the penalty of death and God’s wrath that we had deserved, God has declared the whole world forgiven. “Justification” means that the world of sinful people has been declared forgiven! We call this "objective” justification because this declaration of forgiveness is a fact, outside of us (and thus “objective”); and it is not dependant on any feelings we might have concerning it. Because of Jesus’ death and resurrection, God already has a gracious (forgiving) heart toward sinful people! The second important, Biblical truth is that we are saved from our sins, from God’s wrath and from the devil through faith. Faith, as we see from the above paragraph, does not convince God to be gracious (forgiving and peaceful) toward us. Because Jesus has died for the sins of the world, God has already declared the world forgiven! We are simply to believe this good news! We are not saved because of faith, as if faith were some great work on our part that convinces God to be forgiving. Rather, we are saved through or by faith. The Bible says, “Knowing that a man is not justified by the works of the Law but through faith in Christ Jesus; even we have believed in Christ Jesus, that we may be justified by faith in Christ and not by works of the Law…” (Galatians 2:16). Faith saves because it is the means by which we lay hold of Christ. Faith trusts in Christ as one's personal Savior, and so actually benefits from (receives and has) the forgiveness that God declared for the whole world. We are saved through faith in Jesus, our Savior. We call this “subjective” justification, because through faith we actually have (as our own possession) the forgiveness of sins. What is more, we are saved through faith alone, which means that such faith in Christ is all that is needed for salvation. We do not need to add anything to this faith in Jesus to become right with God. The third important, Biblical truth is that all people are born without knowledge of the Gospel, the Good News of forgiveness in Jesus. In fact, by birth we were all spiritually dead and alienated from God (Eph. 2:1). Spiritually dead, each of us needed to be made alive, be brought back to God, (or be born again) by God's power (Eph. 2:5). Not only were we by birth and by nature spiritually dead, we were also spiritually “blind” and “enemies” of God (II Corinthians 4:4 & Romans 5:10). Once Jesus’ disciples asked Him, “Who can be saved?” Looking at them, Jesus answered, “With men it is impossible, but not with God; for all things are possible with God” (Mark 10:27). It is impossible for us to make ourselves right with God. We cannot rescue ourselves. We must be rescued. That God must rescue us becomes clear when we look at two key teachings of the Bible: the Law and the Gospel. The Moral Law can be described as God's commands for our performance. God’s Law says, “Love God above all things. Love your enemy. Do not lust after someone who is not your spouse. Do not lie. Honor your father and mother. Do not worry.” If you feel uneasy by now, don’t be surprised! The Law's purpose is not to save us, but to show us our sins and our need for our Savior! "Through the Law comes the knowledge of sin” (Romans 3:20). The Gospel is the Good News that Jesus, the God-man, lived a holy life for us, paid for our sins on the cross, and then bodily came to life from the dead. The Bible says, “For I delivered to you as of first importance what I also received, that Christ died for our sins…and that He was raised on the third day…” (I Corinthians 15:3,4). We are not saved by anything we do, that is, through the Law. But, we are saved by faith in what Christ Jesus has already done for us, that is, through the Gospel. The Law of God is found in the Bible. But, God also wrote His Law on our hearts (Romans 2:14,15). The good news of the Gospel, that Jesus is our Savior from sin, was not written on our hearts, but can be found only in the Bible. Since God’s Law is the only resource people have from birth, many - understandably, but wrongly - place their hope in their efforts to keep God’s Law to find peace with Him. But the Bible says, "For by grace you have been saved through faith; and that not of yourselves, it is the gift of God; not as a result of works, that no one should boast (Eph.2:8,9). By birth all people have an idea of God’s Laws and their own sinfulness, but they do not by nature have any knowledge of the forgiveness of sins that Jesus won for us on the cross! Therefore, God has given us the means of grace: the Gospel (that we just described), Absolution, Baptism, and the Lord's Supper. These are the means God has designed to tell people that their sins have been paid for, that God has forgiven them. These means not only inform, but also have the power to create faith, making people spiritually alive and causing them to be born again into God’s kingdom! In addition, these means have the power to strengthen faith in the hearts of those who already believe in Jesus. Let's put these truths together in story form. Suppose the governor of our state declared that all the prisoners in the state penitentiary were pardoned and free to leave. © Objective justification means that God has pardoned all sinners because of the death and resurrection of Jesus. The governor knows that the inmates, guilty criminals that they are, would never suspect that such a pardon would be made. © Man, in the corruptness of his heart, does not know the Gospel of forgiveness in Jesus. Therefore, the governor sends messages to them of their release. He uses different methods. He writes a letter to the inmates, telling them that they are free and can go. He sends the warden to declare his forgiveness. Heeven opens the doors of their cells. © Similarly, God uses the Means of Grace to tell sinners about the forgiveness of sins in Jesus. Through these means God tells us that our sins have been forgiven. And through these means He creates and strengthens our faith in Jesus. Some of the prisoners believe the governor and leave. Others stay in their cells, thinking their crimes are too great to be forgiven. © Similarly, by the working of the Holy Spirit some people who hear their sins have been forgiven believe. These actually have the forgiveness of sins and salvation. Others who do not believe do not have the forgiveness of sins. These are the key treasures of the Bible and the Lutheran faith. For a closer look at the teachings of Lutheranism, order Above All Else, What the Bible Teaches, from Concordia Publishing House, 1-800-325-3040. Scripture quotes are from the New American Standard Bible.